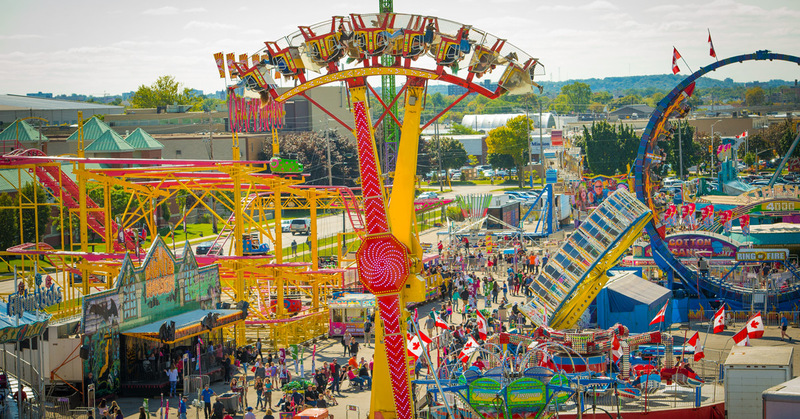 July 11th, 2018, London, Ontario: Reminiscing on days past and anticipating new experiences, this year’s Western Fair combines tried and true with current and new. Check out some of the highlights you can anticipate, coming this Fall. Four evenings of fall fair concerts. April Wine, Walk Off the Earth, Aaron Pritchett and Burton Cummings and Band. Tickets on sale Friday, July 13th at www.westernfairdistrict.com/western-fair/buy-tickets. We’ve doubled your fun this year with bookend weekends of Demolition dynamics. The popular Demo Derby will take over the Grandstand for two Sundays of heart-pumping action as competitors race to take the top spot and be the last car standing. again Boss Hogg and his Celebrity Hill Billy Show, and crowd favourite Bandaloni, a powerhouse one man band with a knack for leaving onlookers dancing along to his tunes and grinning ear-to-ear. Urban and rural come together in perfect harmony. Hundreds of animals will be featured throughout the duration of the 10 day event in beautiful Queens Park and in the Agriplex. As you stroll through the displays you will see beef, dairy, horse, goat, sheep, donkey, swine and rabbit displays. Check out the farm equipment, 6-Horse Hitch and milking demonstrations! There’s no denying that the Llama and Alpacas are also destined to be crowd pleasers. demos! Wood Carving and Cowboy Fred’s C-More Country Corral are back by popular demand. Farmers with a wealth of knowledge will be onsite educating and instructing. Don’t forget the Rawhide Rodeo where you can see professional rodeo competitors go flat out against their rivals with live bull-riding at the World Champion level. You can also take in future rodeo stars as they compete in the high school rodeo. The Western Horse Show is taking the final weekend by storm as high-powered horses and riders compete. History could be made by Christina Crazy Hooper, as she attempts a hula hooping world record! Wood Carvers will create statues and highlight their tricks of the trade. Strolling entertainment at Busk Stops will be doing laps of the fairgrounds, and The Comedy Juggling Act of Craig Douglas will thrill you with his fun, interactive show. Bouncy Barnyards and a blow-up corn maze will be set up in the Agriplex and/or Park for younger children to enjoy during their visit to see the farm animals. The Magic of Aaron Mathews will amaze, as will his side-kick Beat Boxer. Doo Doo the Clown will make your visit unforgettable. Feeling inspired? The Creative Arts Competition in the Canada Building is a sight to see with gorgeous arts and crafts, baking, flower displays, and photography all from local artists. The Anne Eadie stage will come to life with the Rise2Fame competition and final showcase of the best and brightest between the ages of 6 and 21 as they sing, dance and play their way to win. The midway rocks and rolls with over 50 adult and kids rides at Majorland and Kiddieland. Be thrilled and exhilarated as you slide down the Euroslide, reach new heights on the tallest ride, Mach3, take in the view on the Giant Wheel or refresh yourself with a splash cruising down the Niagara Falls Flume ride. Take a break from the midway with over 20 carnival games and win prizes every day at the Fair! Whether an elephant ear connoisseur, funnel cake advocate, or on a quest to find the best candy apples or cheesy pizza, there will be no “hangry” folks around the food vendors. Between Big Pickle Tornado and local offerings at the ILoveLocal tent, there are many menu items available for full-fledged meals, or to simply combat a snack-attack. The only question is…what crazy food combinations will you create? Don’t miss all the action the 2018 annual Western Fair has to offer and keep coming back to the Fair with the amazing promotions we have to offer! Bounce Back – Keep revisiting the fairgrounds to take in all 10 days of entertainment with our bounce back coupon. Any day you attend receive a $5 bounce back coupon! To be redeemed Saturday September 8th – Sunday September 16th, 2018. *Valid for adult and senior admission tickets. Not to be combined with any other offers. 2-for-1 Admission – Come to the Fair Monday to Thursday and get two admission tickets for the price of one! Super Sunday - Don’t miss out! The final Sunday just got more exciting! $10 gate and $30 ride bracelet. *Promotion only available Sunday September 16, 2018, Onsite only. TICKETS ON SALE Friday, July 13th! All prices INCLUDE taxes and fees! Tickets for sale online Friday, July 13th at www.westernfairdistrict.com and WFD Administrative Building 316 Rectory St. M-F 8:30am-4:30pm. Concert tickets on sale online Friday, July 13th at www.westernfairdistrict.com and WFD Administrative Building 316 Rectory St. M-F 8:30am-4:30pm. *Buildings close at 10pm. Agriplex closes at 9pm on the final Sunday.